the way you expect it to, it has not been an adventure at all ." We weren't seeking adventure when we decided to spend most of May in Colorado Springs instead of Austin, TX. We were hoping to avoid "adventure" in the form of tornadoes and flooding that plagued western Texas through April and May. 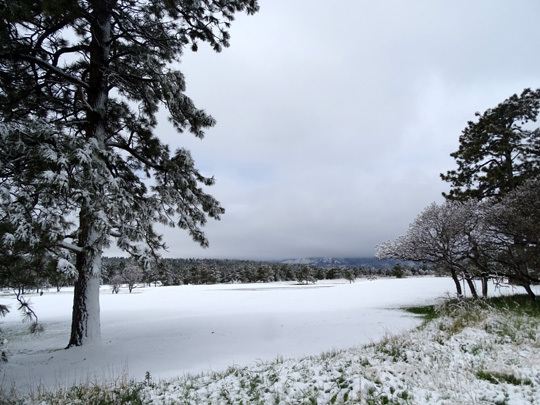 Thankfully, we dodged high winds and flooding on the grounds of the USAF Academy but we didn't exactly find Nirvana -- Colorado Springs had its wettest, coldest May on record. 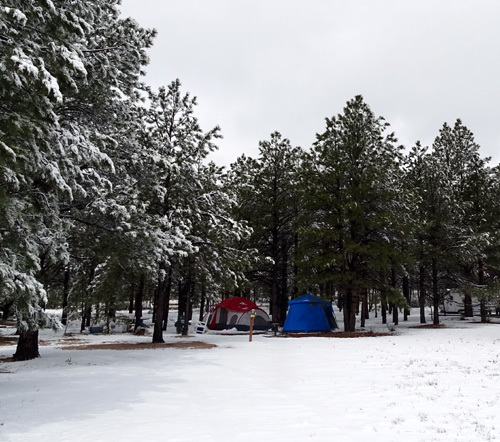 Above and below: May 10 at our campsite -- not exactly what we expected! Some Springs residents suffered from floods and mudslides. The Academy fared better in that regard. 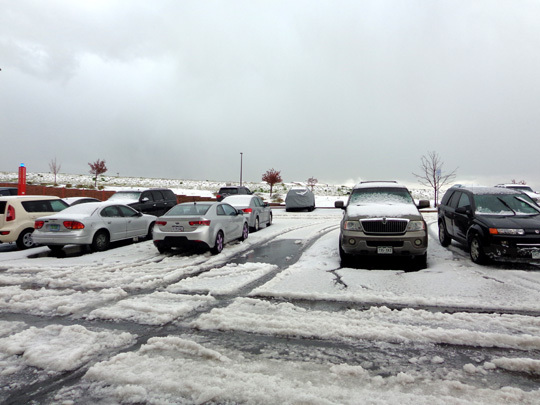 On campus we had more days with rain than sun, temperatures plunging as low as 26 F., several days with highs only in the 40s F., pea-sized hail four times (with 3-6" accumulations twice), and two to three inches of snow as late as May 10. Brrr! That can't be much fun. At least we had a warm, dry RV to live in. It probably sounds like I'm complaining . 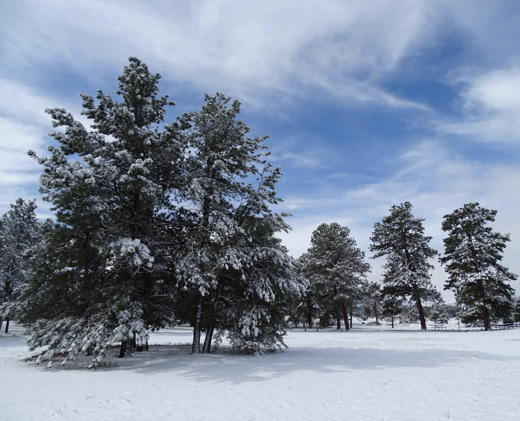 . .
We expected warmer, sunnier weather based on historical averages and at least four previous trips to Colorado Springs in May. 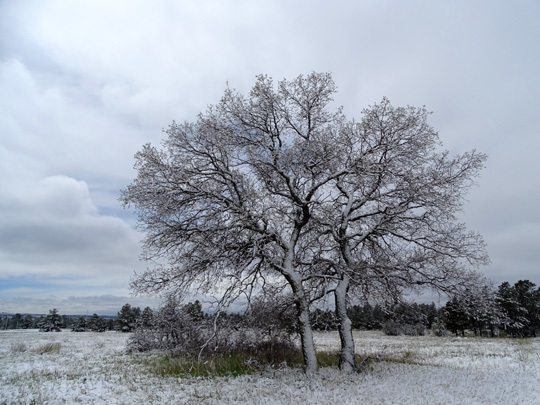 Ironically, it was warmer in northwestern Canada and Alaska for much of May than it was in Colorado Springs. One day it was even warmer in Fairbanks, Alaska than Phoenix, Arizona! What an anomaly. But no, I'm not complaining. Although we got tired of the rainy, cold weather and we wished we could leave Colorado earlier for Alaska than we did, we were glad to be there instead of Austin. One of my relatives describes us as "fickle," in part because we often change our minds about where we're going and we're picky about temperatures and weather conditions. Plan A was to spend the month of May in Austin, Texas, a city we've enjoyed previously. 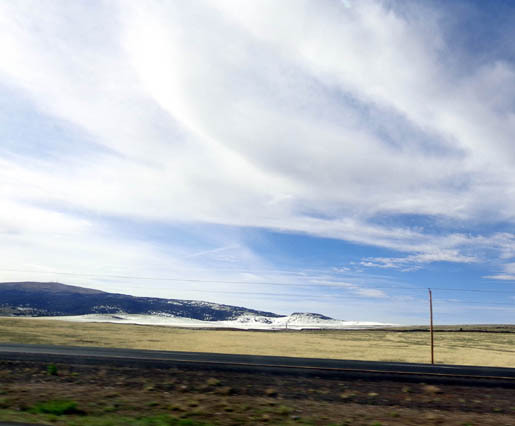 For several months during the winter we talked about having a "medical base" that would have decent weather year-round while we're living/traveling full time in our RV, preferably somewhere out West where we like to spend most of our time. I'll tell ya, finding such a location in the western part of the USA is more difficult than finding one in the East. 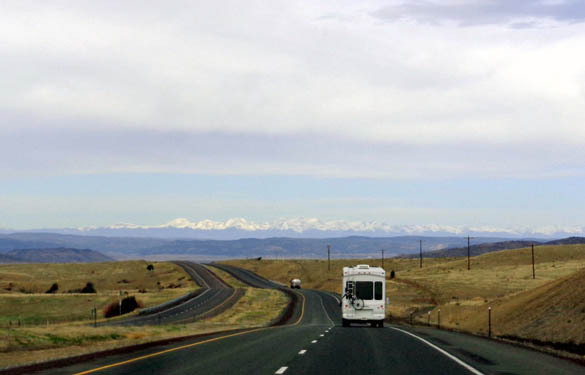 The mountainous areas (Rockies) we love in the summer just aren't suitable for living in an RV in the winter. 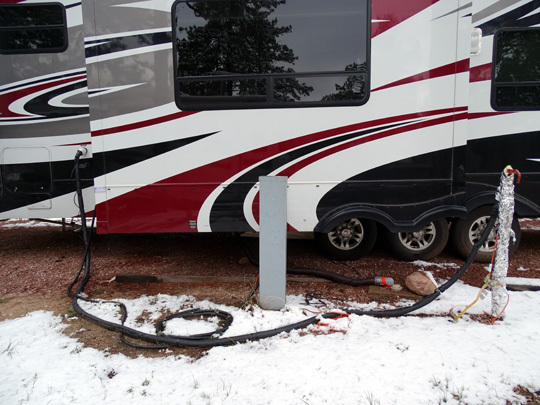 Most RVs aren't insulated well enough and the pipes can freeze. Medical continuity has been a concern since we sold our house in Virginia in 2014 and no longer travel back there in the spring and fall to check on our property. It was convenient to schedule our routine medical appointments then, too, rather than finding providers on the road. Now we no longer have a home base. We thought it'd be a good idea to seek a location with good medical providers in a moderate climate where we could reasonably live in our RV any month of the year. Austin wasn't ideal -- it gets pretty hot in the summer and cold in the winter -- but it is located out West and is a "cool" (hip) place to visit. So we researched dental and orthopedic practices in Austin and made appointments for our dental cleanings and knee injections in May. Finding a decent campground with full hookups in Austin for a month was more difficult. We already knew Austin's house and rental prices have sky-rocketed in the last couple years. 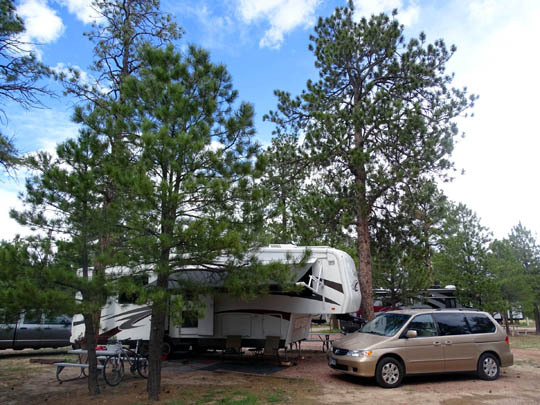 What we quickly learned is that most RV parks in the area are brimming with year-round residents living in travel trailers and 5th-wheels who can't afford the pricy housing market. Seasonal and short-term visitors are pretty much SOL. We finally reserved a spot at a private campground near Lake Travis, farther from town than we preferred. Jim even found a couple interesting "gravel grinder" bike rides in the general area and signed up for them. Then we kept hearing about violent spring storms -- high winds, tornadoes, hail, copious amounts of rain and flooding -- that plagued parts of Texas in April. Some of the worst flooding and destruction was in the Hill Country between San Antonio and Austin. The forecast for May wasn't much better. That's all scary enough if you live in a stix-n-brix house. It's worse if you live in a flimsy-in-comparison 5th-wheel or travel trailer. 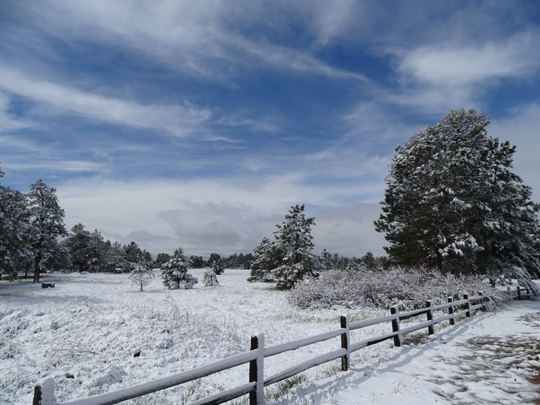 A few days before the end of April we came up with Plan B -- to spend May in Colorado Springs instead of Austin. 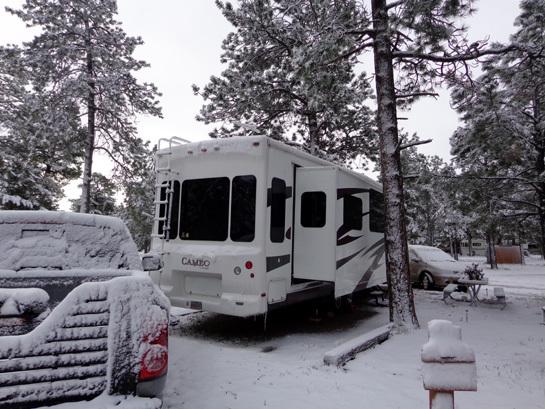 We prefer Colorado Springs anyway, and historic average temperatures, even at 6,700 feet in elevation, are usually warm enough there in May to be pleasant in an RV. 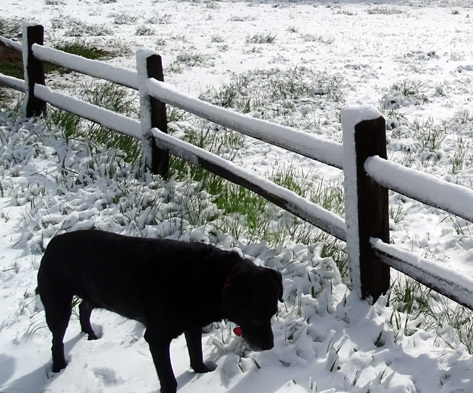 Cody and Casey both loved playing in the snow on May 10. Cody hears something . . .
A few days before we left Florida we cancelled our medical appointments and campground reservation in Austin and made new ones in Colorado Springs. Cancellations at our new doctors' offices allowed us to get in to see our them in a timely manner. 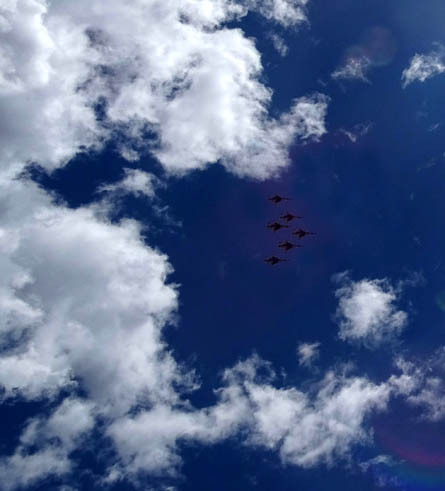 We were happy both with the new dentist and orthopedist we met, as well as hanging out at the USAF Academy campground again. We've been there so often it feels like home to us. Jim forfeited his bike events in Texas, concentrating instead on training for the two longer bike races he entered in Alaska this summer. 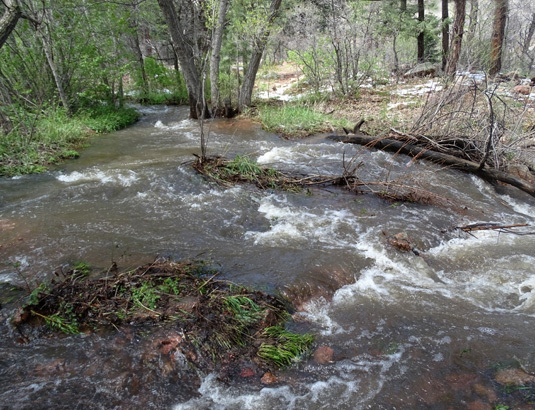 On May 11 I crossed half a dozen flooded creeks along the Falcon Loop; two trekking poles helped. 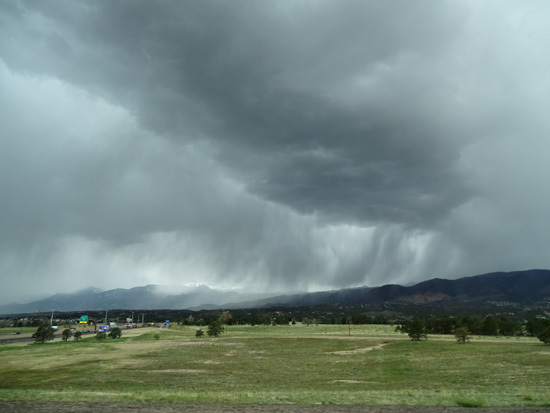 on Pike's Peak and rain in the lower elevations of the Rampart Range. The trails in Red Rock Park were closed most of May due to erosion and mudslides so we weren't able to hike there this time. US 24 through and above Manitou Springs to Pikes Peak and the high country was closed several days because of flooding and mudslides so we didn't drive up that way, either, until the end of the month. Climbing Pikes Peak was also out of the question while we were in the area; there was too much mud and snow most of the time. I couldn't even drive all the way up to the summit on May 27 when I did a day trip to take photos. I'm mesmerized by this mountain and had to see it up close, one way or the other. 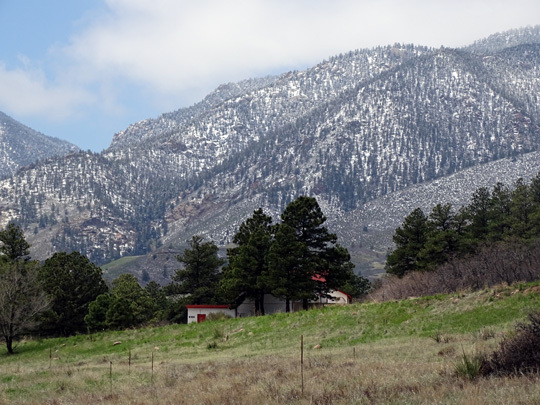 Still lots of snow on Pike's Peak on May 27; this is the northern side of the mountain. Did we ever wish we'd just gone to Austin instead? Nope. Not once. The weather continued to be volatile there during May -- more tornadoes, continued flooding, and deaths resulting from all the violent storms there and in nearby states (OK, KS, MO, AR, LA, and some Midwestern states). 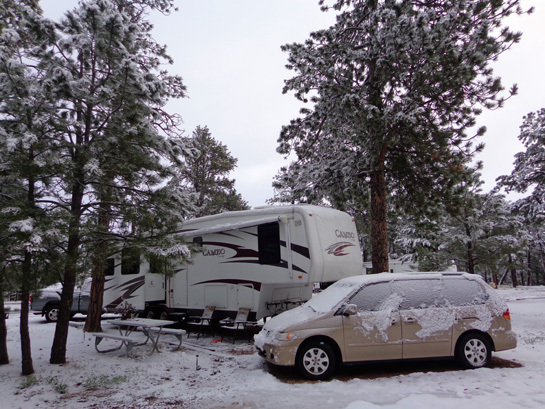 Even though the weather was less than ideal much of the time we were in Colorado Springs, we were safer in an RV there. We were lucky we didn't get into any storms during the four-day drive from western Florida to Colorado. The weather was great the whole time, making driving easier. We had our "weather antennae" out so we could re-route if necessary. and I-25 to Colorado Springs. Looked like we might get wet in NM but we got there shortly after the storm passed through. Jim drove the truck hauling the Cameo with Casey in the back seat for company. I followed in the Odyssey minivan with Cody. That's been a learning curve since we sold the house and decided to keep the van with us. I'm no longer sitting next to Jim in the truck as we drive from one place to another, helping with driving and navigating. It's a lot different when we're in separate vehicles. We've learned to discuss our routes more thoroughly before we get on the road and to write down better notes re: highways, streets, turns, and rest stops. We're doing better with practice. 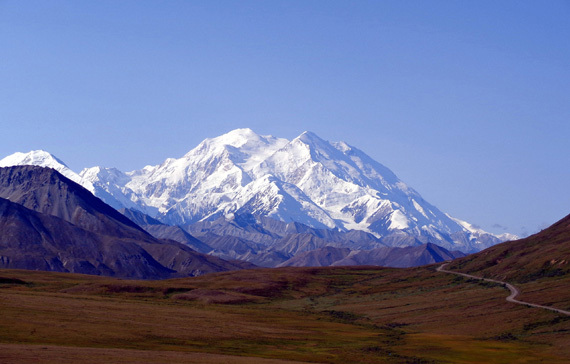 When we get back from Alaska -- the van's not going up there -- we may get a second GPS so I'll have one, too. Just hope the directions match! I've got the easier job in the van, not because I'm following Jim but because the car is so much more comfortable to drive than our truck. The eight-hour days didn't wear me out as much as Jim. We spent the first two nights on the road at Walmart stores in Shreveport, LA and Bowie, TX. The third night we opted for a real campground in Clayton, NM so we could have hookups. It's always interesting to see how the landscape and terrain changes from region to region, from the flat, wet, lush greens of the Gulf states to the parched ranches in TX and NM to new light green leaves and snowy mountains in CO.
After almost two years in the East, I needed my Rocky Mountain fix! 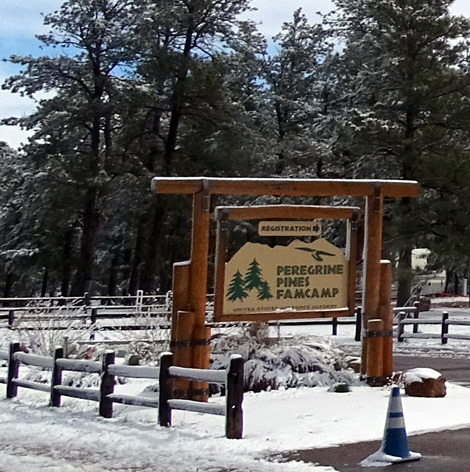 This is the sixth time we've camped at the Peregrine Pines FamCamp, usually in mid- to late May. We aren't fond of cities but Colorado Springs is different. We like it 'way more than Austin. All the sites are nestled in random fashion under tall pine trees. Most sites, including ours, have adequate space on either side so folks don't feel cramped. We have full hookups and can usually get on the campground WiFi. The cost is $24/day with no weekly or monthly rate. Another section of the campground has water and 30-amp electrical hookups but no sewers. Those sites are smaller and cost less. The only downside to this military campground for us is the 30-day time limit from May 1 to October 7. We wish we had the option of a seasonal stay (three months or more) if we want it but the place is too popular for that. 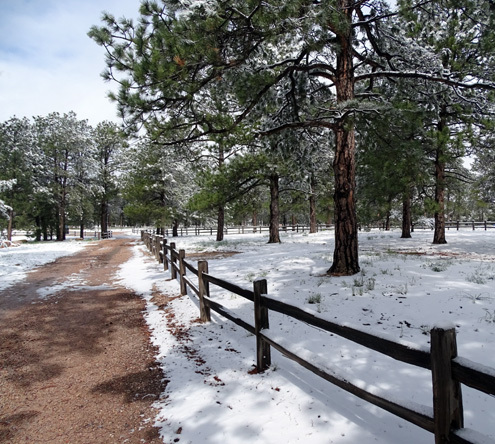 Even with the cold, wet weather we had this month our side of the campground was mostly full every day. Occupancy was usually less on weekdays in the 30-amp section, which is more full on weekends with younger and more local families. If we do make Colorado Springs our "summer medical base" we'll either have to schedule all of our medical appointments within a 30-day window or find another place to stay instead of, or in addition to, the Academy. We like to stay at military bases for several reasons. Sometimes we wonder if they are the safest option, however. About a week after our arrival security on campus tightened to the Bravo level due to increased threats by ISIS. It took longer to get through the gate after going off base and even some retired military RVers had to go through searches when they arrived. In some ways the extra scrutiny, especially of civilians who visit the base, makes us feel safer. Even the Academy could be a desirable target for Bad Guys, though. It's not equipped like most Air Force bases but it does produce the officers. 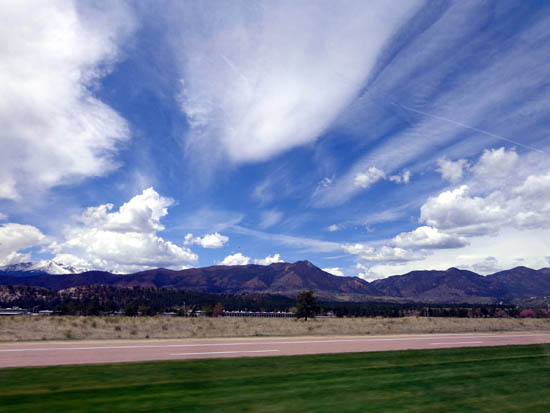 In five prior visits we've already done many of the typical tourist things in Colorado Springs. We didn't have any of those on our agenda this time. We anticipated a more relaxed visit, which is becoming typical since we began RVing full time -- this wasn't a vacation; it's our lifestyle now. Despite the cold, wet weather we got out most days to hike and cycle. At minimum, I walked the dogs several times a day in the campground. One reason we like the Academy so much is its convenience to great hiking and cycling trails. 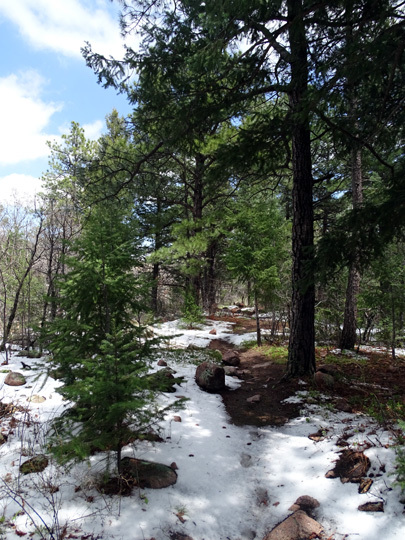 The 13-mile, single track Falcon Trail loop is half a mile from our site. I took the dogs over there to hike many times, and hiked the whole loop by myself twice. Jim prefers riding on dirt or paved bike paths and roads rather than the Falcon Loop, which has some steep and gnarly sections. He can easily ride through the Academy to the long New Santa Fe multi-use trail that runs from Monument, CO through the Academy grounds to the southern part of Colorado Springs. He did training rides of up to 50 miles on this trail; my longest ride was about 20 miles. 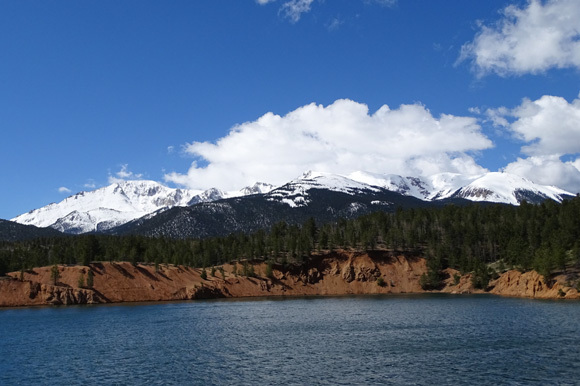 Jim stops along the New Santa Fe Trail to admire a pond and Pike's Peak. We also hiked twice at Garden of the Gods Park and I did a day drive as far up Pike's Peak as the road was open. I'll have separate entries with photos from the two trails, the Garden of the Gods, and Pike's Peak. We had fun talking with several other retired couples at the Academy. One couple that we had met at Kings Bay Sub Base just bought a house in Colorado Springs and camped on base waiting for their closing. We also enjoy talking with active duty folks. The family next to us when we arrived had sold their house in Black Forest in February, much faster than they expected, and bought a 5th-wheel toy hauler to live in pending reassignment to Key West, FL. I gave their young kids some shells I collected at Cumberland Island to help psych them up for their move. of their toy hauler. They also rented a large propane tank to keep the camper warm. Perhaps the most interesting situation occurred when Jim found a wallet belonging to a retired Lt. Col. who dropped it while cycling on base. He and his wife live in Colorado Springs. The wallet didn't contain a phone number. We tried various ways to contact the man and finally decided to just take it to his house, a very nice place on the mountainside overlooking the city. He was very grateful we returned it and invited us inside for drinks and a couple hours of interesting conversation with himself and his wife. He insisted on giving us a monetary reward for a nice dinner out that we finally accepted after much cajoling. A reward certainly wasn't on our minds. It just felt good to return the wallet. We know how upset we would have been if it had happened to one of us. We learned something important from that experience, as did the Lt. Col. -- put your phone number in your wallet in case you lose it and a Good Samaritan finds it. We already had emergency contact information in our wallets but not our own phone numbers until this happened. We also had more mundane but necessary business -- our dental and orthopedic appointments, routine vet appointments for Cody and Casey (at the vet clinic on base for the first time), continued trip planning for the rest of the year (where to go, where to camp, whether to get additional medical insurance for Canada, what to do about phone and internet service in Canada, etc. ), vehicle maintenance, researching vehicle and other insurance policies that were due, etc., etc. Traveling full time doesn't eliminate "chores" like these. If anything, it complicates them. 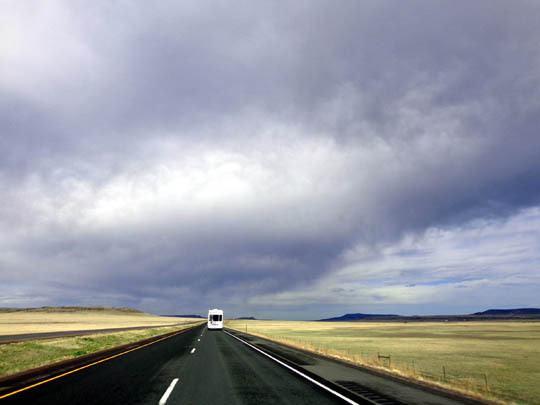 For example, there are fewer companies that insure RVs that are used full time than those that are used less often. So that's easier, right?? Not really. Since the Cameo is our house, it's even more critical that we insure it adequately and with a top-rated company. That took extra time and effort. 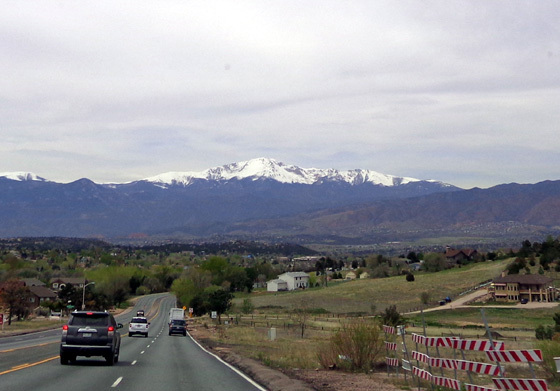 Driving home that day; the Rampart Range is in the background and Pike's Peak is under snow clouds. Jim decided to try a one-dose knee injection called One-Gel. I considered it but decided to stay with the three-dose Orthovisc that's been so successful the last six years. If it ain't broke . . . The reason we couldn't leave Colorado Springs until the end of the month was my decision to get Orthovisc spread out over 2+ weeks instead of Gel-One. My last appointment was May 28, graduation day at the Academy. This is the third time we've been at the Academy at graduation time. It just worked out that way. In retrospect it would have been nice to leave for Alaska sooner, since the weather was so much warmer than usual up there and in northwestern Canada during May. 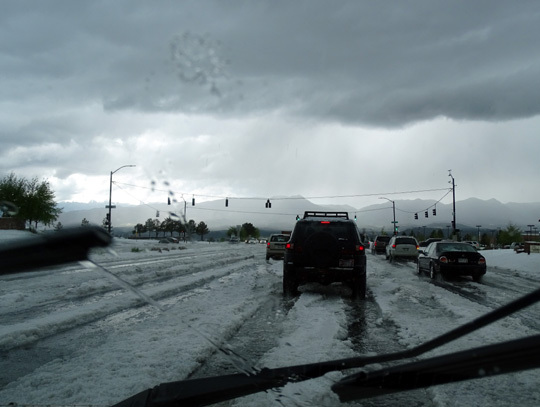 With a lower snow pack and less rain we didn't hear about any problems with flooded roads like we experienced in 2012.